Indian Meteorological Department (IMD) has come out with its much-awaited long-range monsoon forecast. The country's official weather forecasting agency forecasts the June-September monsoon at 96 per cent of long period average (LPA) with a model error of (+/-) 5 per cent, which qualifies as 'normal' Southwest monsoon. 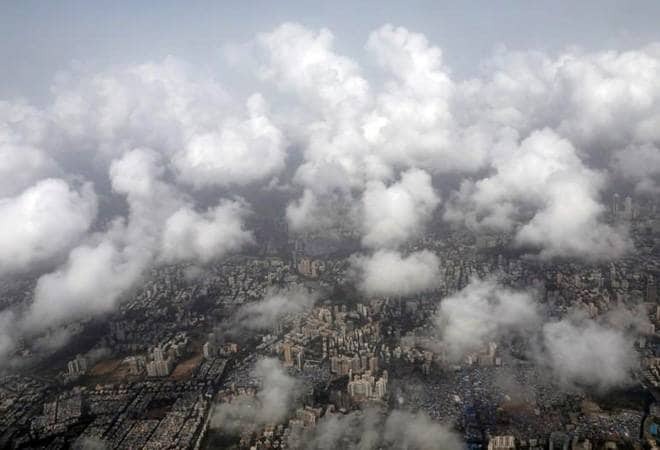 The IMD has attributed 39 per cent probability of normal monsoon, 32 per cent probability of below-normal monsoon and 17 per cent probability of deficient monsoon in FY2020. It notes that weak El Nino conditions currently underway will likely persist in the monsoon season, though the intensity is likely to reduce in the later part. The performance of Southwest is crucial for the agriculture sector and health of the entire economy. The IMD issues two long-range forecasts for the monsoon, one in April and the another in early June. 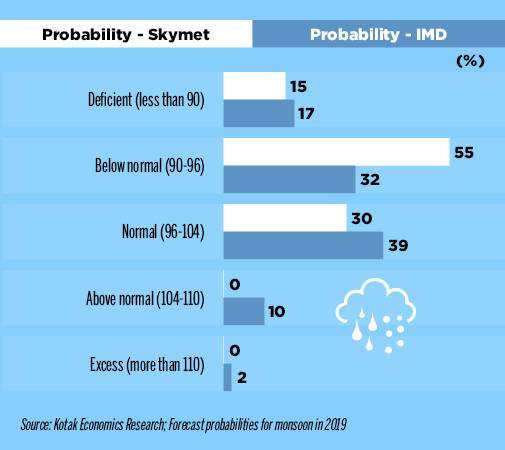 Another independent agency, Skymet, has forecast below normal monsoon at 93 per cent of LPA with probabilities of 30 per cent of normal rainfall, 55 per cent of below-normal rainfall, and 15 per cent of drought. 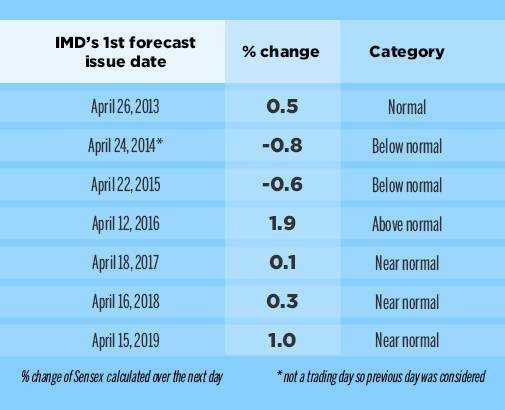 The IMD forecast is slightly more optimistic than Skymet forecast. A Kotak Economics Research report notes probabilities are skewed towards the weaker side. "While it is premature to deduce the effect on food prices and production, a favourable mix of price increase and production level could alleviate the farm distress to some extent, adds the report. A historical look at predictions suggests that IMD has overestimated the monsoon outcome over the past five years. A close look at the chart below highlights the deviations. In 2017, rainfall was near-normal at 95 per cent of LPA, followed by a below normal (91 per cent of LPA) rainfall last year. 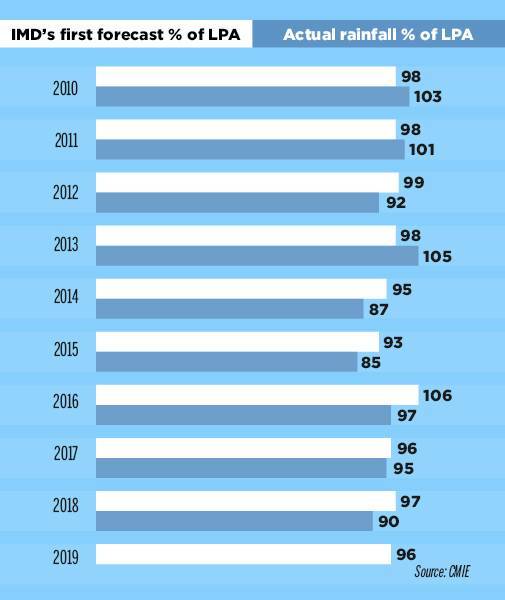 These predictions impact the markets too - at least for the past seven years, the IMD forecasts showed a positive co-relation. In 2013 and 2014, when the weather office gave the first forecast of below normal monsoon, the Sensex declined 0.8 per cent and 0.6 per cent, respectively. Monday's forecast of near normal rainfall pushed the markets around 370 points higher to 39,275.6 level.